The Bersaglieri (Italian pronunciation: [bersaʎˈʎɛːri]) (Marksmen in English) are a corps of the Italian Army originally created by General Alessandro La Marmora on 18 June 1836 to serve in the Army of the Kingdom of Sardinia, later to become the Royal Italian Army. They have always been a high-mobility light infantry unit, and can still be recognized by the distinctive wide brimmed hat that they wear (only in dress uniform in modern times), decorated with black capercaillie feathers. The feathers are usually applied to their combat helmets. Another distinctive trait of the Bersaglieri is the fast jog pace they keep on parades, instead of marching. The relatively poor Kingdom of Sardinia could not afford large numbers of cavalry, so a quick-moving infantry corps of marksmen were needed. These troops were trained to high physical and marksmanship standards. Like the French chasseurs à pied, a level of independence and initiative was encouraged so that they could operate in looser formations, in which direct command and control was not required. They fired individually and carried 60 rounds instead of the standard 40 rounds of traditional line infantry. The first uniform was black with brimmed hats, called "vaira". These were intended to defend the head from sabre blows. The first public appearance of the Bersaglieri was on the occasion of a military parade on 1 July 1836. The First Company marched through Turin with the rapid, high-stepping gait (180 paces/minute) still used by the Bersaglieri in World War II and later. The modern Bersaglieri still run both on parade and even during barracks duty - on penalty of punishment if they do not. The new corps impressed King Charles Albert, who immediately had them integrated as part of the Piedmontese regular army. The corps grew rapidly and by 1852 there were already 10 battalions, each with four companies. Throughout the nineteenth century the Bersaglieri filled the role of skirmishers, screening the slow-moving line and column formations, but acting as special shock troops if required. 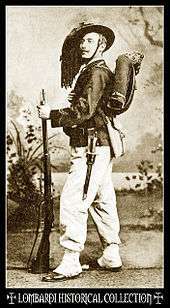 They were originally intended to serve as mountain troops, as well; the climber Jean-Antoine Carrel was a Bersagliere. 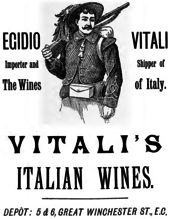 When the Alpini Corps were created in 1872 a strong rivalry arose between the two elite corps. During the First War of Italian Independence (1848–1849) the Bersaglieri distinguished themselves by storming the bridge at Goito. In 1855 the Bersaglieri provided five battalions for the Sardinian Expeditionary Corps in the Crimean War, where they were involved in the Battle of the Cernaia, but suffered more casualties due to a cholera epidemic. While in the Crimea the Bersaglieri acquired a red fez with a blue tassel, in imitation of that worn by the French zouaves with whom they served, as their everyday headgear. 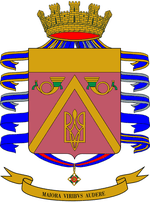 When the Armata Sarda became the Regio Esercito (Royal Italian Army) in 1860, the existing 36 battalions were used to create six Bersaglieri regiments, which had administrative and disciplinary duties. The regiments were assigned to the army corps', with the regiment's battalions assigned to the divisions in the corps as reconnaissance units. The most famous action of the Bersaglieri occurred on 20 September 1870, when the 12th Bersaglieri battalion stormed Rome through a breach created by Italian artillery in the Aurelian Walls near Porta Pia leading to the capture of Rome and end of the temporal power of the Pope, thus completing the unification of Italy. A monument was erected in 1932 in front of Porta Pia to commemorate the event at the same time as the National Museum of the Bersaglieri corps was moved to Porta Pia, where it resides still today. In 1871, the Bersaglieri corps added another four battalions and the regiments were increased from six to 10 and given also operational command of the battalions. In 1883 a further two regiments were added for a total of 12 Bersaglieri regiments, one for each army corps with three battalions per regiment. Therefore, the four battalions raised in 1871 were disbanded. During World War I, the 12 Bersaglieri regiments were augmented by nine newly raised regiments and fought with distinction on the Italian Front. Of the 210,000 members of Bersaglieri regiments, 32,000 were killed and 50,000 wounded during the war. Italy's last surviving World War I veteran, Delfino Borroni, served in the 6th Bersaglieri Bologna. Another member who served (and was wounded) was Benito Mussolini. A contingent of Bersaglieri was sent to participate in the Sinai and Palestine Campaign in 1917, when they were attached to the Egyptian Expeditionary Force commanded by General Edmund Allenby. Their "mainly political" role was to assert "hereditary ecclesiastical prerogatives in connection with the Christian churches at Jerusalem and Bethlehem." After the war the nine wartime regiments were disbanded and the number of Bersaglieri battalions in the remaining regiments reduced to two per regiment. A new role was seen for the light infantry as part of Italy’s commitment to Mobile Warfare. The post-war Bersaglieri were converted into bicycle troops to fight alongside cavalry in the Celeri (fast) divisions. Elite units with high morale and an aggressive spirit were seen as one way to break such tactical stalemates as the trench warfare of 1915-18. The Bersaglieri gave Italy highly trained formations suitable for service with both cavalry and tanks. When the armoured divisions were formed in 1939, the link between the Bersaglieri and mobile warfare continued. Each new armoured and motorised division was allocated one Bersaglieri regiment. A single Bersaglieri regiment, the 3rd Bersagleri, took part in the Second Italo-Ethiopian War in October 1935, invading from Eritrea as part of the 30th Infantry Division Sabauda under General Italo Gariboldi. There, they took part in the Christmas Offensive and the Battle of Amba Aradam, among others. The regiment was detached and sent back to Asmara in March 1936 to join a new unit, the East Africa Fast Column under Achille Starace. Italy began the Second World War with 12 Bersaglieri regiments of three battalions each. Over the preceding years the Army had resisted suggestions to dilute their quality, and recruits continued to be of above-average size and stamina, endured intense physical training and had to qualify as marksmen. During the war an additional Bersaglieri regiment, the 18th, with three battalions was raised, but only one of its battalions saw actual combat. The Bersaglieri fought in southern France and then in Greece, later Bersaglieri regiments were also deployed on the Eastern Front. One battalion of Bersaglieri participated in the East African Campaign. After the Armistice of Cassibile between the Kingdom of Italy and Western Allies on 8 September 1943, Italy split in half. The Republic of Salò continued the war alongside Nazi Germany. Its Army, the fascist National Republican Army, raised the 1st "Italia" Bersaglieri Division, which was attached to the German 14th Army in a sector on the Northern Apennines. The division fought along the Gothic Line, and at the end of the final allied offensive, along with two Wehrmacht and last Italian fascist Army Divisions, surrendered after the Battle of Collecchio. On the other side of the front the Italian Co-belligerent Army raised a Bersaglieri battalion as part of the Legnano Combat Group from remnants of the 4th Bersaglieri Regiment. During the Cold War the Bersaglieri were exclusively employed as mechanized infantry. The Bersaglieri battalions were part of the armoured or mechanized regiments of the Army's armoured divisions, with the mechanized regiments fielding two Bersaglieri and one Tank battalion, while the tank regiments fielded two Tank and one Bersaglieri battalion. Attached to the motorized division were armoured infantry regiments, which consisted of one Tank and one Bersaglieri battalion. 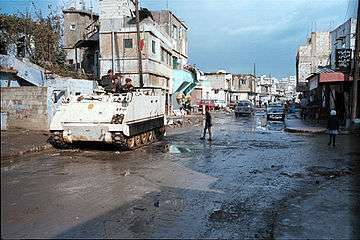 Without exception the Bersaglieri battalions were armed with M113 armoured personnel carriers. The only two active Bersaglieri regiments at that time were the 3rd Bersaglieri and 8th Bersaglieri Regiment in the Centauro Armoured Division and the Ariete Armoured Division respectively. In 1975 the Army abolished the regimental level and battalions became independent under newly formed brigades. The Army formed the Goito Mechanized Brigade with the regimental command and units of the 3rd Bersaglieri Regiment and the Garibaldi Mechanized Brigade with the regimental command and units of the 8th Bersaglieri Regiment. Both brigades received one extra Bersaglieri battalion from disbanded armoured infantry regiments and both fielded only personnel - with the exception of the tank crews and artillerists - from the Bersaglieri corps. Additionally the Bersaglieri fielded five anti-tank companies, one per Bersaglieri and one per Armoured Brigade (Ariete, Centauro and Mameli Armoured Brigade). With the end of the Cold War, the Italian army began a reduction in personnel and units which also affected the Bersaglieri. On 1 June 1991 the Goito Mechanized Brigade was disbanded, while the Garibaldi Mechanized Brigade moved to the Southern city of Caserta, as the Army had decided to reduce the number of units in the north of Italy. The Garibaldi arrived in Caserta on 1 July 1991 and changed its name to 8th Bersaglieri Brigade Garibaldi. Also in 1991, the battalions of the Army were renamed as regiments without changing composition. While in the past the mobility of the Bersaglieri was helped by their training in running and by the aid of bicycles, regiments currently in service are all mechanised. 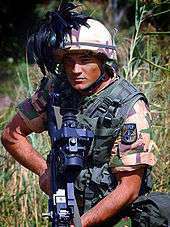 The modern Bersaglieri have served, as part of the Garibaldi Bersaglieri Brigade, as peacekeepers in the Multinational Force in Lebanon, and in Yugoslav and Somali Civil Wars, and were also active in Operation Iraqi Freedom. Bersaglieri traditions are still stressed. The Bersaglieri collar patches are crimson-red "flames". Enlisted troops still wear the red fez. Officers wear black berets with their ordinary uniforms, but the feathered "vaira" in ceremonial uniform. They also wear black gloves, while other Italian regiments wear white ones. Each Bersaglieri unit had a band called a "fanfara", who played their instruments at the run while on parade. The "fanfara" does not contain percussion instruments. Today only the Garibaldi Brigade, Ariete Brigade and 7th Bersaglieri regiment retain a "fanfara". The 1953 movie Roman Holiday (starring Audrey Hepburn and Gregory Peck) includes a stunning film clip of a Bersaglieri fanfara as part of a military parade in the early part of the picture. The 1st, 8th and 11th Bersaglieri regiments serve in their traditional role as tracked mechanized infantry in the army's two heavy brigades, while the 3rd, 6th and 7th Bersaglieri regiments are the third manoeuvre element in wheeled mechanized infantry brigades. In mid-1800 the Bersaglieri were born as light infantry sharpshooters fighting in loose skirmish formations, and specific bugle calls were used to direct the units in the confusion of the battlefield. Each battalion had its own specific bugle call played repeatedly to rally the troops or used as a sort of "address" before tactical bugle calls, to identify who the order was intended for (for example, a composite bugle call could be "1st Bersaglieri" + "Company" + "Right/Nr.3" + "Deploy in open order"). Giannasi, Andrea. "Il Brasile in guerra: la partecipazione della Força Expedicionaria Brasileira alla campagna d'Italia (1944-1945)" (Italian) Prospettiva Editrice, 2004. ISBN 8874182848. Pages 146-48. Popa, Thomas A. "Po Valley 1945" WWII Campaigns, United States Army Center of Military History, 1996. ISBN 0-16-048134-1. CMH Pub 72-33. ↑ Popa, 1996. Page 23. 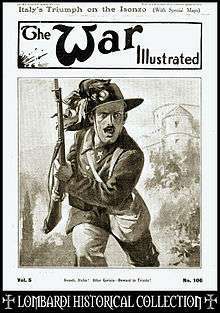 Wikimedia Commons has media related to Bersaglieri.